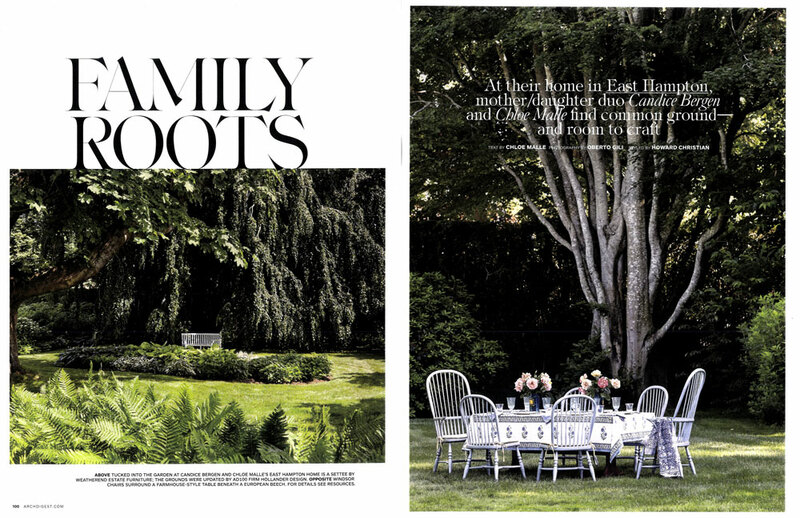 “Every now and then a Bunny can be spotted hopping across my family’s East Hampton garden. Usually it’s morning, when the creature is hungry, lured by the prospect of breakfast. She is also, I should clarify, human­Bunny being the nickname my mother, Candice Bergen, has used for me (and I for her) for over 15 years. “Hollander divided the lawn with a white picket fence and a border of hydrangea and Japanese anemo­nes, beyond which he created a secret garden of shade plants, wide-leaf hostas, and ostrich ferns beneath the 150-year-old maples. “Every property tells a story, and this story was the trees;’ recalls Hollander, who trucked in a 35-foot sycamore from New Jersey, causing a temporary closure of the George Washington Bridge. The apple trees that line the property’s perim­eter were an anniversary gift to my mother from Marshall. Meanwhile, the border garden (conceived by Jill and landscape designer Jane Lappin, who still tends to it) is the yard’s colorful crown, with loose tiers of hollyhocks, dahlias, and snapdragons.